It’s A Mini Sale … Act Quickly! Give yourself the gift you really wanted! Still have room on the tree? We can help! Celebrate365.com still has a large stock of European artisan-crafted ornaments. Why not give yourself a gift? In addition, the shop will be closing soon for the winter. We will be leaving behind the Midwest’s winter cold in favor of sun and sand in Mexico’s Yucatan peninsula. We will be away for 7 weeks and the store will be closed during that time. Follow this blog as well as the Celebrate365 Facebook page to see what life is like for us in the Yucatan area. I taught high school Spanish for 26 years but I never envisioned a retirement perk quite like this! Use the coupon code GOOD16 for a 15% discount on your order. Expires 12/31/16 … at the stroke of midnight! ONE TIME use only, exclusions apply including previously reduced items, one-of-a kind folk art and 2016 “New Arrivals”. Author Connie PorcherPosted on December 28, 2016 December 29, 2016 Categories Celebrate365, David Strand Designs, De Carlini, Eric Cortina, glass ornament, Halloween, Italian free blown, Italy, On Sale, ornament, Poland, Scott Smith - Rucus Studio, Thomas Glenn, Thomas Glenn Ornaments, UncategorizedLeave a comment on It’s A Mini Sale … Act Quickly! Leaves are changing colors … autumn is in the air! 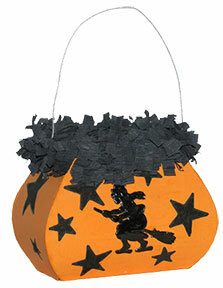 Celebrate365.com has lots of ornaments and decor for autumn, Halloween, Day of the Dead and Thanksgiving. Take some time and browse a bit! Author Connie PorcherPosted on October 12, 2016 October 12, 2016 Categories Bethany Lowe Designs, Bruce Elsass, glass ornament, Halloween, Italian free blown, ornament, Scott Smith - Rucus StudioLeave a comment on Our Treat to You! You know that I’ve been traipsing around Germany and generally having a fabulous adventure. Now, it is back to reality … and Halloween. I love the fresh, crisp shades that autumn brings. I did look for vintage Halloween decorations at the Leipzig Flea Market but did not spot a thing, Of course, German Halloween production was primarily exported to the United States. So, perhaps we have it all here! 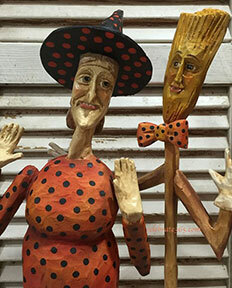 Amid medical appointments at the Cleveland Clinic and preparations for our trip to Germany, I began a serious efforts to search and find long-overlooked Halloween and fall styles that had appeared in past issues of Celebrate365. 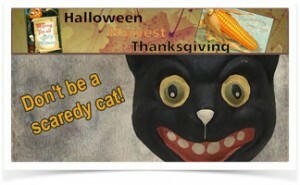 I’ve added quite a few pieces in both the “Halloween” and “Opportunities” category themes in the store. Some are one-of-a-kind. Others are from Bethany Lowe Designs and Bruce Elsass … long-retired and difficult to find. Available from Celebrate365 at Saturday’s event … along with all of Scott’s Halloween glass ornaments. 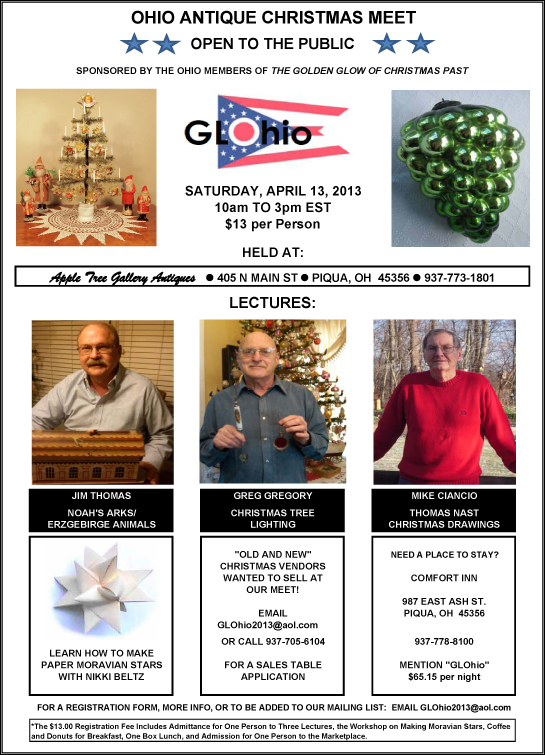 Golden Glow Ohio “GLOhio” will be having our first Antique Christmas Meet this Saturday, April 13, 2013 at Apple Tree Gallery Antiques. The event begins at 10:00 am. Doors open at 9:30am. Turn WEST (left when coming from the South) onto E Ash St/US-36 W.
Take the 1st right onto N Main St.
Street parking is limited in front of the store. Public Parking is located behind the store building. Free Public Parking is available off of Ash before you turn onto N Main St. There are parking lots on both sides of Ash directly across from each other. See the Map attached to the email. Parking is highlighted in blue on the map. DIDN’T REGISTER? – YOU CAN STILL PAY AT THE DOOR! We have over 80 registrations for the event and expect another 40 to 50 people to pay at the door. You can still attend the event by paying $5.00 at the door. A boxed Lunch will NOT be available, but attached to the email is a map of local restaurants that are within walking distance of the store. If you have any questions, just shoot me a contact using the tab at the top of this page. I will be bringing things that cover all 4 seasons. In other words, 365 days of the year! Hope to meet you in Piqua! PIQUA, OH- Apple Tree Gallery, downtown Piqua’s 365-day Christmas and Halloween store, will be hosting a unique educational and shopping event on Saturday, April 13. Area collectors are invited to attend. Mark Saturday April 13 on your calendar. The event will be open from 10 am through 3 pm. Twenty-two Golden Glow vendors will be on hand offering merchandise from all holidays, not just Christmas. And the items for sale will range from antique, vintage and current holiday merchandise. Shoppers will find everything from vintage holiday postcards, aluminum Christmas trees to contemporary ornaments from Patricia Breen, Christopher Radko and Mattarusky. In addition, Apple Tree’s galleries of holiday collectibles will be open to shoppers. Glohio’s event won’t be just about shopping. It’s also a unique educational opportunity. Glow members will offer three focused lectures along with one make-it, take-it workshop. Former Glow president Mike Ciancio will speak about Thomas Nast and the Christmas illustrations for which is he famous. What would the Christmas tree be without lights? 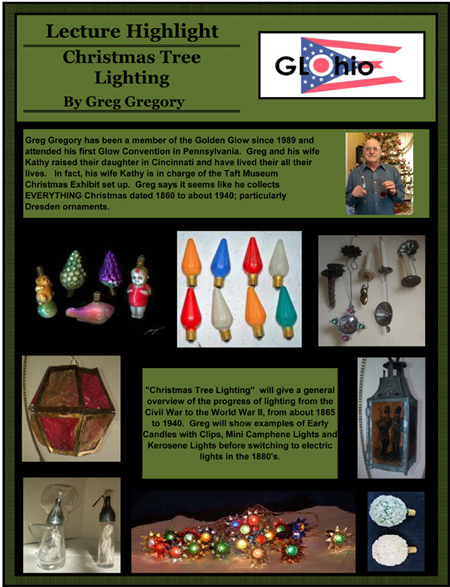 Greg Gregory will offer a brief history of “lighting” the tree from candlelight to electric lights. What about the toys under the tree? 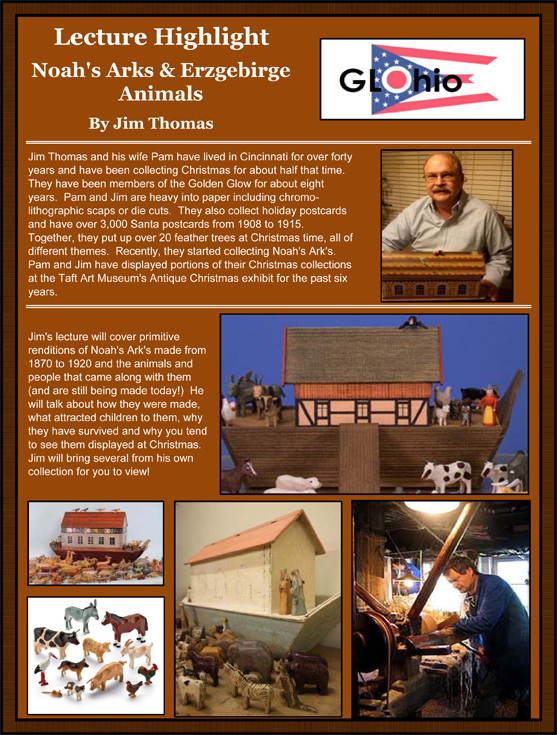 Jim Thomas will talk about Germany’s Erzgebirge region and one of its best-known Christmas antiques, the wooden Noah’s Ark. Nikki Beltz will let visitors try their hand at making vintage-style Moravian stars. Learn how simple strips of paper can be folded and woven into a three-dimensional star that German families used to decorate their Christmas trees. 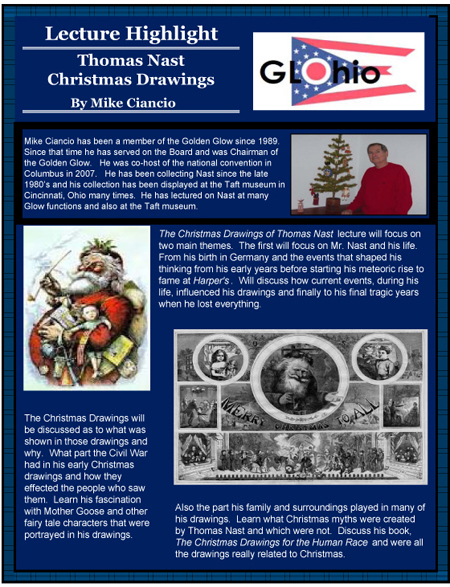 This first meeting of the Ohio Chapter of the Golden Glow of Christmas Past is expected to draw visitors and exhibitors from surrounding states including Michigan, Pennsylvania and New York and Indiana. The cost to attend all the educational sessions plus the marketplace is $5 per person, payable at the door. For more information about the event, call Apple Tree Gallery at 937-773-1801 during store hours or use the Celebrate365 contact tab here at the top of the page.See you in Piqua!